The naturalist John Muir once observed that “when one tugs at a single thing in nature, he finds it attached to the rest of the world.” I’m no bearded environmental philosopher, but I do like to kick back with a pint sometimes and dwell on our interconnectedness. In the realm of craft beer, brewers and buyers often muse on the national and international history of the craft — but that must square, for many of us, with a desire to farm, grow, brew, and drink close to home. Wearing my Beerhunter hat, I do my best to test that balancing act. Valley beer is a singular thing, but tug on it a bit, and you find it’s attached to the rest of the world. With a few far-flung exceptions, I try to cover only those points of New England craft beer culture that are easily accessible from the Valley, and comfortably covered by an afternoon drive. That’s what took me off the Pike last week to poke around the town of Sturbridge, just off exit 9. My goal: to check out two breweries here, practically within shouting distance of each other, that play a role in Worcester County’s expanding craft beer scene. First I stopped in at Rapscallion Brewery. After a high-speed hour heading east on the Pike, it felt strange to pull off onto a winding drive down a narrow country road toward Rapscallion’s woodsy campus. The rustic red building, which resembles a large sugarhouse, sits alongside a pretty pond and a disc golf course, which is open seven days a week from sunrise to sunset. This playful summer-camp atmosphere is at the heart of Rapscallion’s mission. The brewery and taproom site is all about hanging out and relaxing, as opposed to the quicker, more meal-driven turnover at the company’s restaurant, located an hour east in Acton. There’s food here in Sturbridge, too: thanks to the food truck parked outside Thursdays to Sundays, visitors can grab sandwiches, salads, buffalo chicken tenders, burgers, and cheese plates (you’re also welcome to BYO-food). On the Saturday night I stopped in, the brewery — which offers flights and full pours, plus 32-ounce cans and 64-ounce growlers — had hit a lively stride, with music and laughter filling the several connected rooms. Much like a ski lodge, it’s a welcoming space no matter how long you plan to stay: in addition to wi-fi, the bar has wine, cider, kombucha, and non-alcoholic drinks like house-made root beer. It’s not hard to picture killing a couple of hours here among friends. What I can’t promise from Rapscallion is a revelatory craft beer experience. I tried a flight of four beers: a black IPA and a rye IPA (both mainstays here) as well as a porter and a “Munich Dark” lager. The IPAs were both too bitter for my taste, with little body and not much to recommend them (although the black IPA is more drinkable by default, given its smokier profile). The porter, similarly, came off watery. When I return here, I’ll be ordering a pint of the Munich Dark, which is — as promised — dark, sweet, malty, and easy to enjoy. Rapscallion seems to have found its crowd, but to this traveler, the quirkier and more intriguing scene is at Homefield Brewing, just a few minutes down the road and located in the basement of a small antiques shop. If getting a beer at Rapscallion feels like drinking at a sugarhouse, stopping by Homefield feels like crashing a rich but easy-going neighbor’s wine cellar. As I walked in, a jazz quintet called Dozer and the Homewreckers was warming up, and saxophone riffs filled the small room. It’s more compact in here than at Camp Rapscallion, but also more low-key. Homefield was founded quite recently – in 2015. In terms of American craft beer innovation, that puts it a few waves ahead of Rapscallion, which is actually a rebranding of Concord Brewery, founded back in 1995. You can taste the difference. 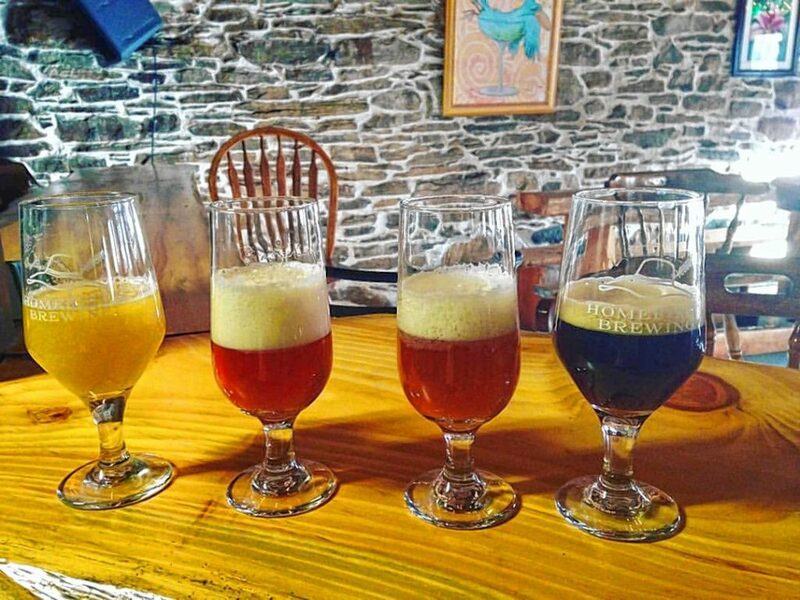 Homefield’s four beers on tap — which you can purchase as a flight — are all creative, complex, and highly enjoyable. Serenity is a hazy, dark-orange ale loaded with citrus and pine notes. Optimism, a drier and more hoppy version of Serenity, has a nice sharp Mosaic finish. Emphathy, a chocolate rye with piney hops, is big and flavorful — not, as I feared, thick and cloying. And Mantra, a dark-roasted barley ale infused with maple, falls on the sweet side, but it’s well-made and nicely balanced. These are earthy, rooty beers, which is fitting for a self-professed “field to glass” brewery. Everything at Homefield feels humble and handcrafted — even the owners’ business cards, stacked at one end of the nice long wooden bar, are printed on the plain cardboard inside of cut-up old cereal boxes. And the menu, which features tons of local ingredients, jumps from cheeses and fruits to lacto-fermented veggies, salmon bacon, and smoked bluefish paté. Rapscallion’s vibe is appealingly sporty — who wouldn’t want to play some disc golf on a warm summer night? — but Homefield Brewery is the real hidden beer gem of Sturbridge.